How many things have been invented over the years that have actually come about from either a mistake, or the crazy notion that putting two seemingly oddball things together just might be the next best thing since the day someone dunked a hunk of chocolate in a jar of peanut butter. I had that revelation today after heading out to the garden and picking the first 2 Poblano Peppers that were ready, and as I looked at the Poblanos, dinner popped into mind. Chiles Rellenos (pronounced Chi-leys Rey-yeh-nos) are an extremely popular Mexican dish that is not only packed with a ton of flavour, but there are as many different renditions of this dish depending on the region of origin. The ‘traditional’ method of making Chiles Rellenos is to stuff already roasted, cooled and deseeded Poblanos with a cheese and/or meat mixture, breading and deep frying them, then serving them with an enchilada sauce and sour cream. Delicious yes, fattening…you betcha. Not great for the arteries either. So what’s a girl to do that is concerned about keeping her ‘girlish’ figure and her arteries flowing? Do what I do best. Which is to re-invent/modify/tweak a recipe until it comes out like I envisioned. 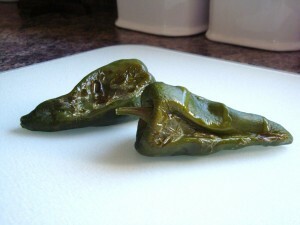 As I was pondering on how to make the Chiles Rellenos without the breading and frying, it finally hit me. 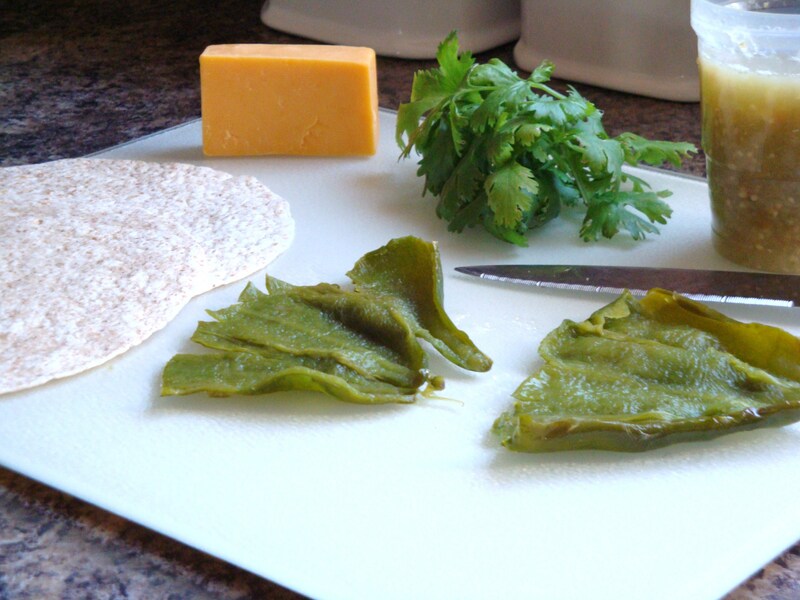 Why not use low-fat whole wheat tortillas and stuff them with the roasted poblanos and cheese and then roll them up…enchilada style? Ding – Ding – Ding! This idea had fantastic potential, usually my first tweaking ideas are duds. 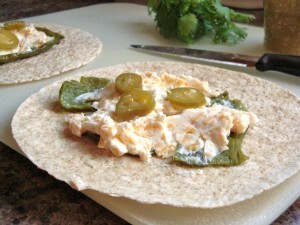 But I thought further…hmmmm… I adore Jalapeño Poppers as well so why not use the cheese filling of a Popper and spread that as a layer on top of the poblano that is on the tortilla and roll it up? Roast the poblano peppers in a 350°F oven for about 25 minutes, turning a few times until the skin is blistered. Remove and let cool in a plastic bag for about 10 minutes. Slice the Poblano from stem end down to the point on one side and cut around the stem, peel away the skin and core. Open like a book and scrape out the seeds. Set aside. Combine the cream cheese and shredded cheddar cheese in a small bowl; set aside. Place a warmed tortilla (zap in the microwave for 15 seconds) on a plate, lay one of the poblano pieces in the centre of the tortilla. Spread half of the cheese mixture over the roasted pepper on the tortilla. Top with 3 slices of pickled Jalapeño peppers. 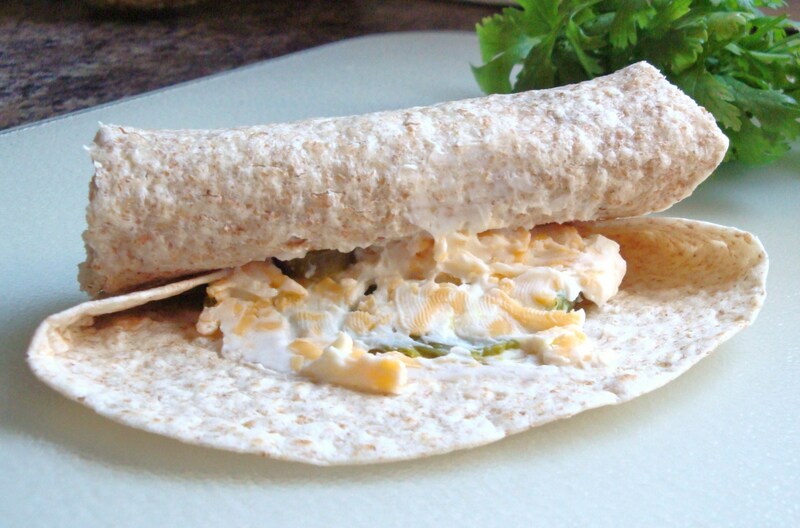 Fold two sides of the tortilla towards the middle and then roll the tortilla up. Place seam side down in a casserole dish. Spoon the Tomatillo Salsa overtop of the enchiladas. Cover and bake in a preheated 350°F oven for 20 minutes. 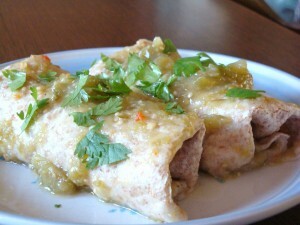 Top the Chiles Rellenos Enchiladas with fresh chopped Cilantro and serve hot. This ‘tweaked’ Chiles Rellenos rendition of the classic turned out fantastic. I can not wait to make it again. This will definitely be added to my Vegetarian Collection, as I think my daughter will enjoy them immensely. If I could raise chickens….. I would have plenty of fresh eggs every day. Fresh eggs are amazing. You know where they came from and exactly how old they are. Something you have no idea about with the ones purchased in the store. I would have fresh eggs for breakfast, eggs for baking my world famous chocolate chip cookies, or cakes and breads, making egg salad sandwiches, quiches and custards and of course, eggs for dying at Easter time. But I don’t have any chickens. Mainly because the city where I live would most certainly throw a hissy fit and demand their removal. They have a silly by-law making sure the residents don’t raise farm critters within city limits and creating noise and nuisance to your neighbours. Pfft…. if I wanted to annoy my neighbours, I could think of a hundred different ways to do just that…quite easily in fact. But I don’t. Cause I am nice. 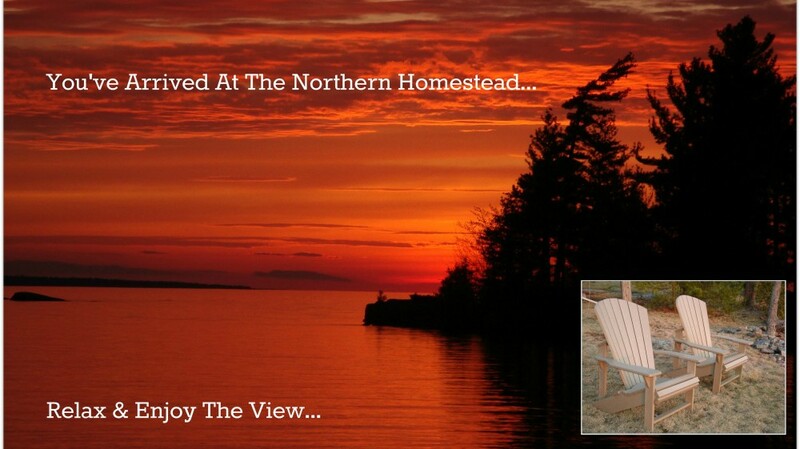 As for the Homestead up north, I could raise chickens there…but the problem is, I am not there all the time. I would need to have someone go over and feed/water them and collect the eggs. Those would be MY eggs they would be collecting… I can’t have that. What’s the point in having chickens if other people get to keep the eggs? So….looks like I will have to wait until retirement before I can raise some cluckers. Meanwhile, I wonder if I can coax one of these ducks to start laying for me….after all, I am already feeding and watering them. The least they could do is give me some eggs in return. Garden Harvest # 1…Peppers, Tomatoes, Garlic…and what is that in my pool? I arrived home yesterday to a mini-bounty of vegetable goodies after being up at the Homestead for almost 2 weeks. Usually when I have to leave the Homestead, I drag myself to my car kicking and screaming (not easy to do and the neighbours look at me funny) and then I proceed to pout for the entire 3+ hour drive. I am not kidding, its true. Happens every week. I can’t help myself. But yesterday I was actually a little… just a *little* excited about coming home. Because I knew after such a long absence, there would be beautiful, colourful garden jewels to pick. As well as a surprise. There is always a surprise when I come home, I never know what it will be either. Sometimes it is a nice surprise, sometimes not….I will leave the surprise until the end of this post. No scrolling down to peek either. After getting home and emptying the car of cooler, computer bag and clothes, I head out back to see what my efforts have in store for me. There are Peppers and Tomatoes READY for picking! 2 Poblano Peppers, 4 Jalapeños and 7 Serrano Peppers. Along with a LARGE handful of Cherry Toms. I do believe something of Mexican Origin Cuisine is going to grace my mesa tonight. ALSO….and this was so very exciting (well, to me anyway), my Garlic was ready to be harvested! I had planted some back in early spring (you can either plant in the fall for next year or spring for this year) and due to the hot, dry summer so far, they were ready. So I dug those out and they are now hanging to dry. They need to ‘cure’ for 2 weeks this way, out of the sun but with plenty of air circulating around them. Then you can either use them up, or store in a cool place and use within 3-4 months. As I surveyed the remainder of the garden, I was a tad miffed my regular tomatoes are not ready yet. Lots and lots of green tomatoes on the plants, but nary a spec of colour on any of them. They better get with the program quick – I am dying for a freshly sliced, jumbo tomato dashed with salt and pepper. My Herbs on the other hand need another mowing. The Sage-Brush is back at it, trying to take over the garden and the mint is trying to escape its pot. Once the evening came and the temp had cooled down, I was able to get out there and try and tame the fragrant little buggers. What can be dried by the hanging method is now hanging downstairs. But a funny thing is happening with my lettuce….before I went to the Homestead, I chopped down and gave away about 6 heads of lettuce to the neighbours (I really couldn’t eat that much lettuce) and left a few in the ground for when I came back….well….now it looks like the lettuce has gone back in time to the 80′s and has adopted quite the 80′s BIG HAIR hairstyle….egads….reminds me of the guys from Platinum Blonde. Sort of Mullet-ish with the long leaves at the bottom and the short, spikey ones on top. I think these guys are done. Time to use what I can and dig the roots out. At the top of this post I eluded to a surprise….and that I always come home to one. Sometimes I get a nice surprise, like the book I ordered arrived or the endless things that need to be ordered to keep a Homestead running gets delivered. But, there are also some not so nice things to come home to when you have an inground pool. There will always be the potential to find something either in or on or at the bottom of the pool. Yesterday it was these 2 guys….apparently they thought since the pool had not been used in over a week, they were taking it over. I may have to set up a Cabana to serve Margaritas and call it…. Our family loves to eat this tasty freshwater fish. So much so that we eagerly await opening season in May and head out to *try* and catch dinner. Sometimes we come back empty handed and therefore resort to cooking hamburgers for dinner, and of course sulk the entire time we are eating. But when we are able to bring back some of these tasty morsels of the fish world, we are like kids at Christmas time. Absolutely and positively excited about the dinner that is soon to hit the table. This recipe is from my husband’s grandmother. I was introduced to it way back when I was dating my future husband and have been cooking it this way ever since. Which is going on some 30+ years. She had been making it for many, many years before that, so I am thinking this recipe is as old as the hills. 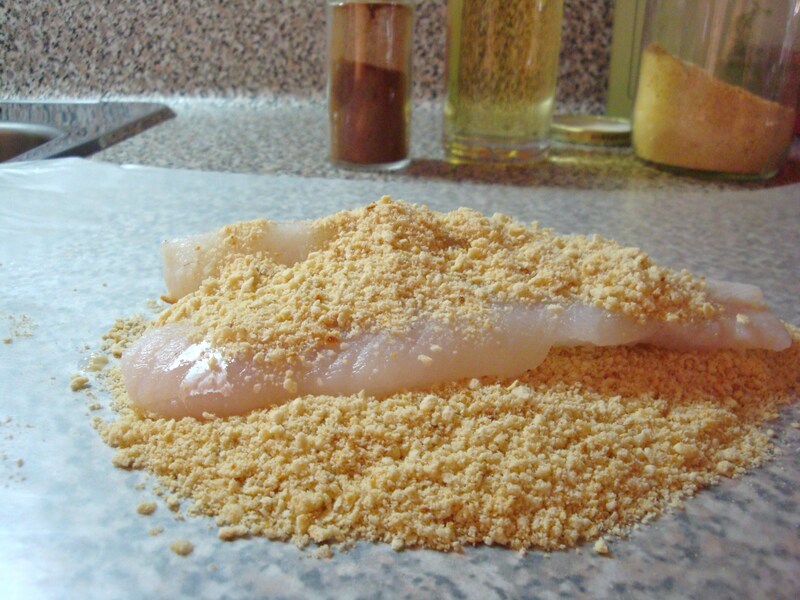 Start off with some freshly caught and fileted pickerel (skin off). I don’t do the fileting, we would be eating something else if it was left for me to do. Hubby is great at it though. There is a narrow strip of bones down the middle of each filet that need to be taken out and he learned this tip from his Grandpa when he was youngster and still filets them the same way. Nothing worse than picking fish bones out of your teeth in my opinion. 1 sleeve of Saltine Crackers (un-salted tops), finely crushed. Soak fish filets in a bowl of salted water for at least 2 hours; drain, rinse and then soak filets in the Buttermilk for another hour. 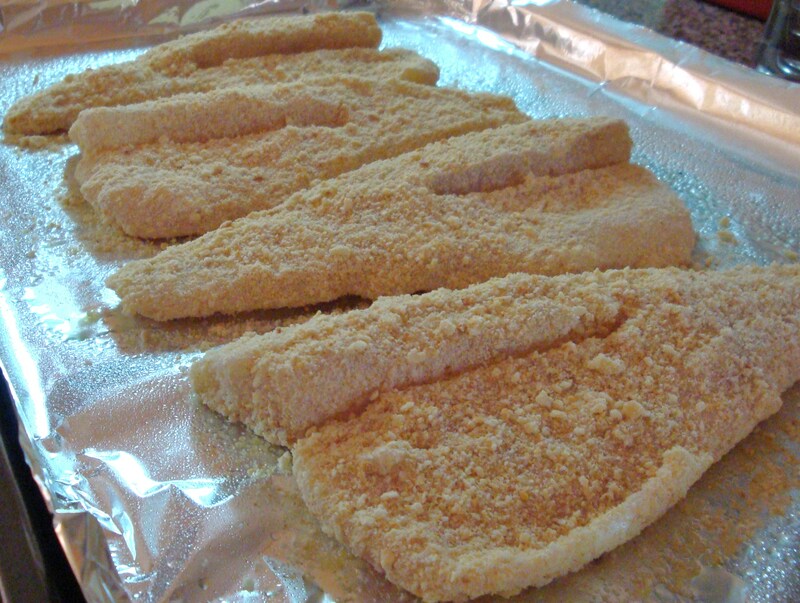 Drain and rinse filets and pat dry with papertowels. 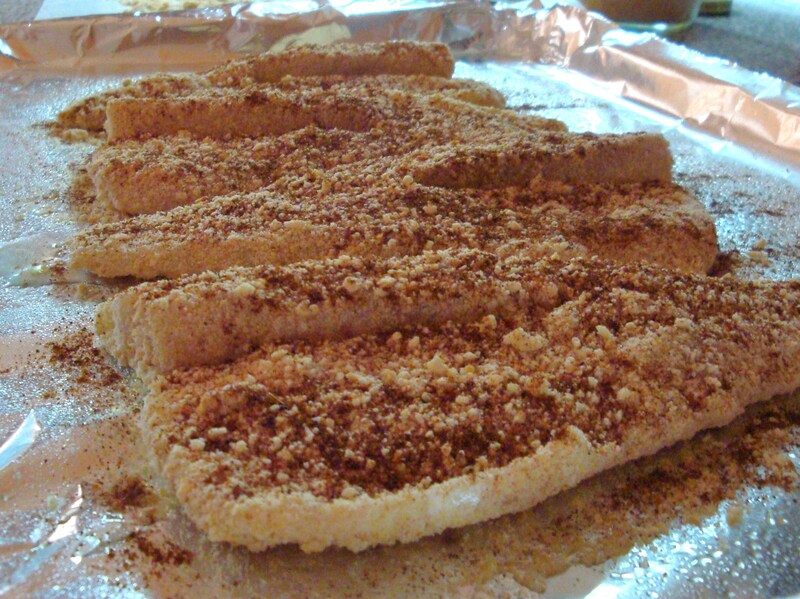 Thoroughly coat filets in the crushed cracker crumbs and place on a foil lined baking sheet that has been sprayed with cooking spray. Liberally sprinkle filets with Paprika and drizzle lightly with Olive Oil. Bake in a pre-heated 375°F oven for about 20-25 minutes, depending on the thickness of your filets. Fish is done when it flakes easily with a fork. * Buttermilk can be made at home by taking 1 cup of milk and adding 1 Tbsp of Lemon Juice or Vinegar. Stir and let sit for a few minutes and then use as directed above. They are called by either name depending on what side of the border you are on. Canadians call them Pickerel. Americans call them Walleye. I call them DEE-LISH on my plate. With a squeeze of lemon for good measure. They are a freshwater fish with firm, white flesh and have been made famous by many a fishing show shorelunch excursion. Italo…eat your heart out. Catching a stringer full of pickerel is THE BOMB. Yummy. Yummy. In my Tummy. Depending on what lakes you visit in Ontario, there are limits as to how many you can catch/have in your possession at any point in time, and also the size of the ones you can keep. Click here for an Ontario Zone Map to find out what you can catch/keep wherever you go fishing. Limit 4 per person (with Sport Fishing Licence) at any time and none between 40 cm and 60 cm (15.748 in. to 23.622 in.) in length. These are the breeding size and one 18″ female pickerel can carry approx. 62,000 eggs in her lifetime. That is a lot of caviar. For eating, hubs and I love the ones in the (30.48 cm to 38.1 cm) 12 in. to 15 in. size range. We don’t like the larger ones as they take too long to cook and are not as tender. To cook up these freshwater beauties, we use my husband’s grandmother’s recipe that has been around for oh….about 50 yrs now, maybe even longer, maybe even 150 yrs. We bake them as opposed to frying, so health-wise, they are much better for you. Now that I have introduced you to this exceptional freshwater dinner menu item. Get out there and catch your own shorelunch and experience Ontario’s bounty. You may possibly even run into Italo. If you do, tell him I said hello and that my fish were DEE-LISH. Always a beautiful day at the Homestead. Wishing everyone a safe and fun summer! Is organizing your home office space high on your Resolutions List for this year? Yes, I know that we are well into July, but it is even more imperative that you stop procrastinating (or lounging pool-side) and get the job done now before it’s time to make next Year’s Resolutions. Organizing a home office isn’t as daunting when you have the tools and know-how to overcome your clutter. Did you know that 50% of all households have at least one member of the family that works from home or has a home office space? and that being productive is a direct result of being organized? and being organized can lead you to more money? So…what are you waiting for? The first step in being organized is to CLEAR CLUTTER….clutter is the bane of all work from homer’s. It is insidious in nature really…one minute it isn’t there, and then overnight (or two or three or twenty-seven) you can’t find your computer mouse one morning and you blame the cat. What makes up clutter? Endless little pieces of paper, ‘notes’ to ourselves about whatever it is we need to do and when, files heaped upon one another looking like a ready made diving board into your cuppa joe for your pet guinea pig. Bills that have been paid as well as ones waiting for your bank account to deem them worthy enough to be paid….all this paper truly gets in the way of productivity. Not to mention all the little things that you use in a home office.. i.e. staplers, staples, paperclips, pens, pencils, markers, scissors, stickynotes, etc… all stuffed in random locations or laying around waiting for their time in the limelight. So to clear all this clutter, you need to answer a few questions…. What can I keep it in? How can I keep clutter from taking over after a clean sweep? Start off first with sorting all your writing instruments, stapler, staples, etc., and invest in some trays and holders from your local office supply store and designate a space/holder for all these items. Next, clean out ALL the desk drawers, start from scratch, vacuum the dust bunnies out of them and wash them down, now place all the holders you just purchased for your desk implements in and organize them by drawer as to how often you use them (for pens/pencils. etc, you may want to keep a cup holder on your desk, but they can equally be kept in a drawer, out of sight), top drawer gets the frequently used items and so forth. Files and Paper ~ Do you really need to keep all that paper? In this day and age of technology, almost everyone has a printer/scanner/copier, if not, invest in one, the prices of these machines are very affordable and also an expense item on your tax sheet . Now scan and store the documents that are a MUST-HAVE on your computer’s hard drive (remember to have a back-up location set in place, talk with a computer techie to get a back-up system up and running to avoid data loss), then SHRED the hard copies. Shredding hard copies will make an immediate difference in the space you have. If you MUST keep hard copies, utilize colour-coded file folders and have a place OUTSIDE of your home office space to store them (invest in Banker’s Boxes, as they make great storage boxes for files and can be kept in your basement / crawlspace with easy access). Colour code files by category, such as green for financial, blue for personal, red for utilities, etc., keep the most recent files (12 months and under) in a file cabinet in your office, anything older is relegated to the Banker’s Boxes in the basement. If you do not have a file cabinet, invest in one, they will be easier to find than combing through mountains of them stacked on your desk. Mailings & Labellers ~ If you are in sales and tend to do a lot of mailings, invest in a label printer that allows you to save all your contacts, then you can just set it to print and away you go. Have a specific drawer just to hold all your envelopes, labels, stamps. Electronic Appointment Organizer ~ If you are still in the dark ages of the 80′s and do not own a Blackberry/Android/iPhone or Email Program, it is time to drag yourself at least into the early 2000′s. You do not need the calendar on the wall with a million sticky notes stuck to it and your computer screen. Organize all your appointments in an electronic calendar. Synchronize these with other family members who are sure to have the same devices (especially the younger family members who have saved their paper route money to buy the latest/greatest gadget) so everyone is on the same page about daily life and to also keep your work appointments organized. My Blackberry is worth it’s teeny weight in gold to me, I set reminders on to-do’s and have all my appts logged in it as well as my full business contact list (just make sure you back up your PDA regularly to avoid losing valuable data). Computer CD’s, etc. ~ I don’t know about you, but I seem to have one very full desk drawer designated to hold all the computer programs that have been purchased over the years…. I mean some of these pre-date Windows 95! Sit and go through them all and keep only the most relevant ones and toss the remainder into the garbage. Then grab an empty shoe box, label and store all these CD’s in with your file boxes in the basement….and voila! an extra drawer just became available to hide your chocolate stash! Books/Shelving ~ if you have a book-case or closet, invest in wicker bins/decorative baskets to hold bulkier items and sort through all the books and banish the ones you no longer need/want to a re-use centre. You don’t need to keep every single Nancy Drew / Hardy Boys novel you ever read from your youth taking up valuable shelf space. Keep only what is relevant to your business life at this point in time. Decor ~ lastly, home offices need not be sterile and boring. Paint the room a colour that suits your personality, if you like purple – go purple! If you are more of a beige person, then add splashes of colour by selecting bright window treatments or chair cushions for some added zing. Having a pleasant space to work in also makes you more productive! Once you have pared down, tossed, recycled and organized your home office space, keeping it that way is simple. Be diligent in taking 5 to 10 minutes at the end of every day to sort, store or shred items so that when you ‘leave the office’ at the end of the day, it looks exactly how you found it in the morning. So I ask you again… what are waiting for?! Get yourself moving to a more organized and productive YOU….then you can go back to sipping a margarita pool-side and enjoy the rest of the summer season. OOOORRRZZZOOOO…. I love saying the word ORZO. It kinda rolls off the tongue and sounds cool. Maybe Ferrari should create a new car and call it Orzo. I would buy one. I bet a lot of people would. 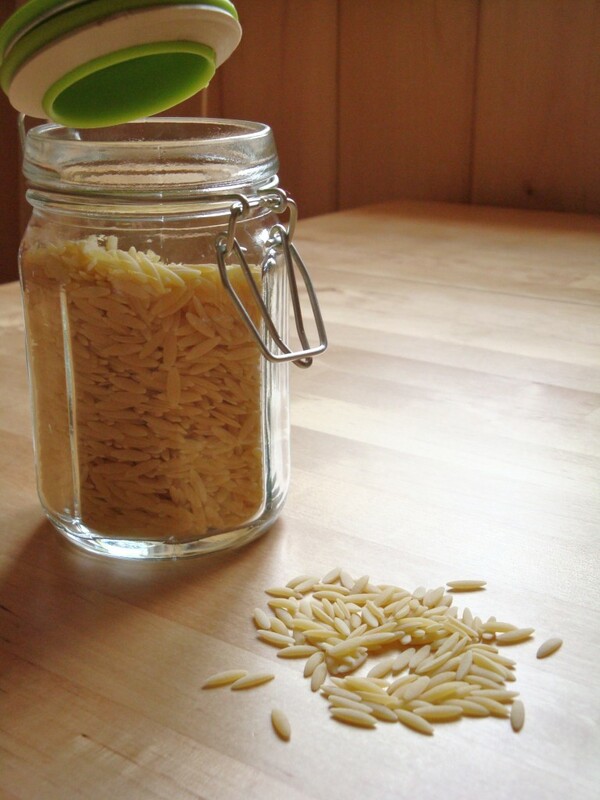 Orzo is a small pasta. The word Orzo is actually Italian for ‘Barley’. It is shaped like a grain of Rice or kernel of Barley, only larger. It has gained it’s fame over the years from being included in numerous Italian soup, casserole and side dish recipes. It is the star of an Orzo with Parmesan and Sun-Dried Tomatoes. It has an almost risotto like quality in it’s appearance as a hot side dish. Orzo is silently attempting to overthrow the Elbow Macaroni in the cold pasta salad department. Elbow has had a lock on cold pasta salad dishes for decades. Pretty much everyone has their ‘own’ recipe for macaroni salad. The old standby for holidays, pot lucks and picnics. But now there is a new kid in town that is smaller and allows for more veggies to be included in the same size bowl of salad as a regular macaroni salad, but don’t tell the kids that. Easy and quick to cook (taking as little as 8-10 minutes for al dente), these marvelous little pasta nuggets are ideal for throwing a quick picnic salad together, like my Mexican Orzo & Black Bean Salad. So why not take that old standby macaroni salad recipe and revamp it using Orzo? I bet you will love the change and the texture. Be adventurous! It’s only pasta after all. Herbs….Herbage…Herbaciousness….are fantastic for livening up your culinary experiments in the kitchen, whether they are fresh, dried or even fresh/frozen. Most people use dried herbs purchased in dusty little glass bottles that have been sitting on a store shelf since at least 1982 and cost as much as a small car. These are *ok*, if you like blandness in your food that is. As opposed to the smack-in-the-face whiff of fresh or freshly dried herbs that makes your nose happy to be first in line to smell the wonderful aromas coming from your stockpot. I have been growing and using fresh herbs for a number of years now and couldn’t do without the basic ‘pantry staples’ of fresh herbs. 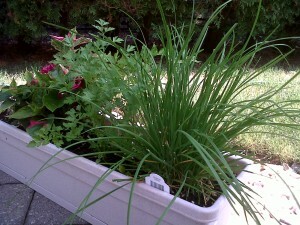 Rosemary, Chives, Oregano, Parsley, Cilantro, Thyme, Sage and Mint. Unfortunately with our Canadian climate, I do not get to enjoy the fresh for very long. So to make my fresh herbs last until I can start a new batch indoors in late winter, I have been harvesting and drying herbs to use when I no longer have the fresh ones around. There are several ways you can dry herbs, and some herbs are better suited to drying than others, more on that later. 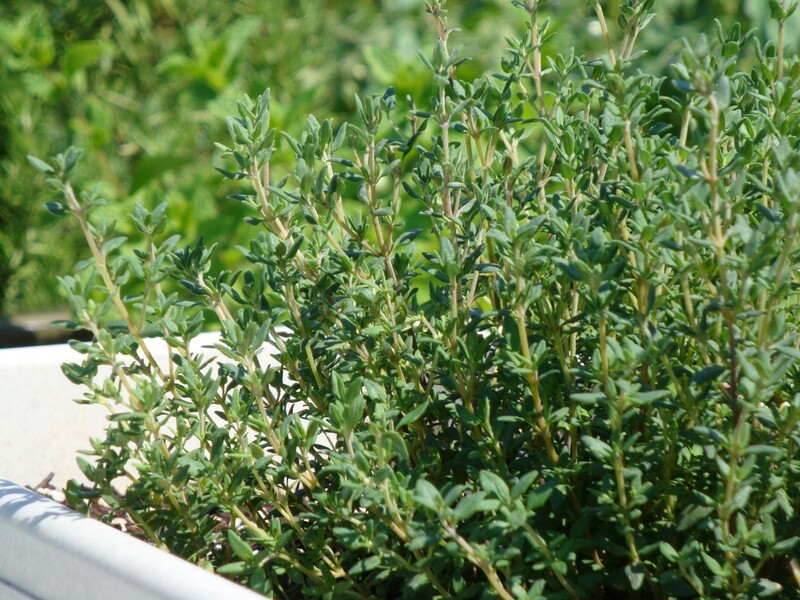 Always start with freshly picked, unblemished and washed herbs. Pick herbs in the morning after the dew dries but before the heat of the day sets in. This will ensure they stay fresher longer. Wash them in cold water to remove dirt, debris and any teeny insects. Dry on paper towels and then proceed with one of these methods…. The Hang ‘Em High Method: Just as it sounds, this is one of the easiest, least time-consuming way to dry herbs. You tie up little bundles of herbs with string and hang them in a warm, dry place for several weeks and voila…dried herbs ready to be packaged up and stowed away. Oven Drying Method: This is the quickest way to dry herbs if you are pressed for time. Like if you won the lottery and are planning the next 6 months at sea on a ship…if that’s the case, then I hate you. Spread prepared herbs out on a cookie sheet and place in the oven. Turn the oven on to 200°F and after it reaches temp, turn the oven off and turn the oven light on. Leave the tray inside without opening the door for at least 4-6 hours or preferably, overnight. Remove in the morning and they are ready to be packaged up. Dehydrator Method: Just as the name implies, if you have a food dehydrator, you can use to dry your herbs following the instructions in the manual. I do not have a food dehydrator, so will abstain from giving any potential useless/erroneous info to you. Freezing/Preserving Method: For that fresh herb flavour, this method can’t be beat. Just as easy as the hang ‘em high method, a little time spent provides a freezer full of flavour for later. Take a couple ice cube trays and fill halfway with water. Take whole or chopped leaves of herbs and push them into each cube portion. Pop in the freezer until firm. Remove and top up with water and re-freeze. Once frozen solid, pop the cubes out into Ziploc® bags and store in the freezer. 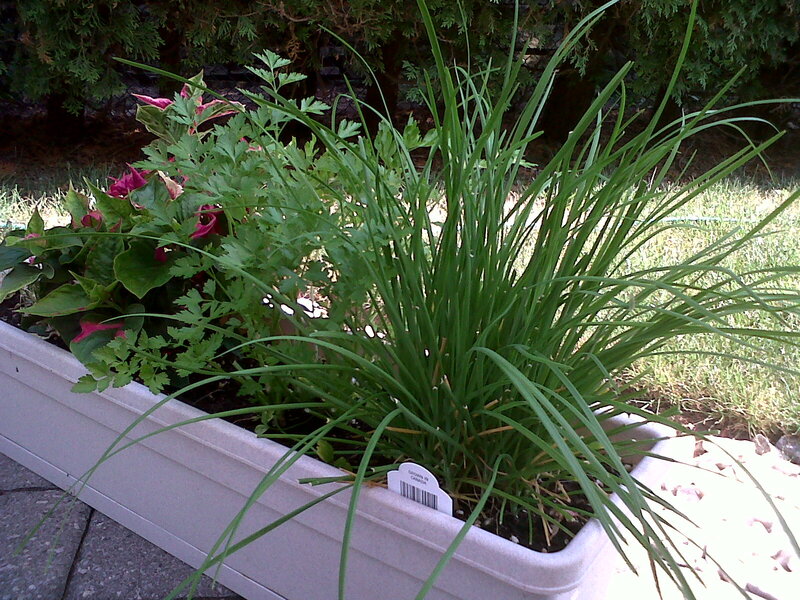 When you need some fresh herbs, pop them out into whatever you are cooking. This method works very well for soups and sauces and really doesn’t add much liquid to whatever you are cooking. *Sage leaves are one of the few herbs that take to freezing on their own very well. Just lay them on a cookie sheet and pop in the freezer, once frozen, place the leaves in a Ziploc® and store them in the freezer. When you need a leaf or two, they will be easier to take out than one big blob of sage leaves. To package up your dried herbs, separate the leaves from the stems (try not to crush the leaves) and then place in clean, glass jars (reusing old jam jars is an eco-friendly idea or use canning jars) and store in a cool, dark place. Dried herbs will spoil in high heat, moisture or sunlight. So keep your herbs stored in a cupboard/pantry and use up within one year. It is extremely important to keep an eye on your jarred herbs for a couple days after you have packaged them up. If you notice any moisture building up on the insides of the jars, repeat the drying process or the herbs will go moldy. Herbs that need some extra TLC when drying: Dill, Basil, Sage, Mint and Lemon Balm, because of their higher moisture content, should be dried using the oven method. If you try to hang them to dry, they tend to go moldy. If you are drying and storing seeds (i.e. Coriander from the Cilantro plant), store them whole to be ground up as you need them. Pick herb seeds when they have changed colour from green to a pale, light tan/brown colour but before they pop open and scatter. Place them in a paper bag and hang in a dry place until they are sufficiently hard and dry (several weeks). There you have it… Herb Drying 101 from The Homesteading Realtor. Actually….can someone help me to help yourself to some lettuce? Seriously, please come over and save me. Sheesh…who knew lettuce could grow this fast. 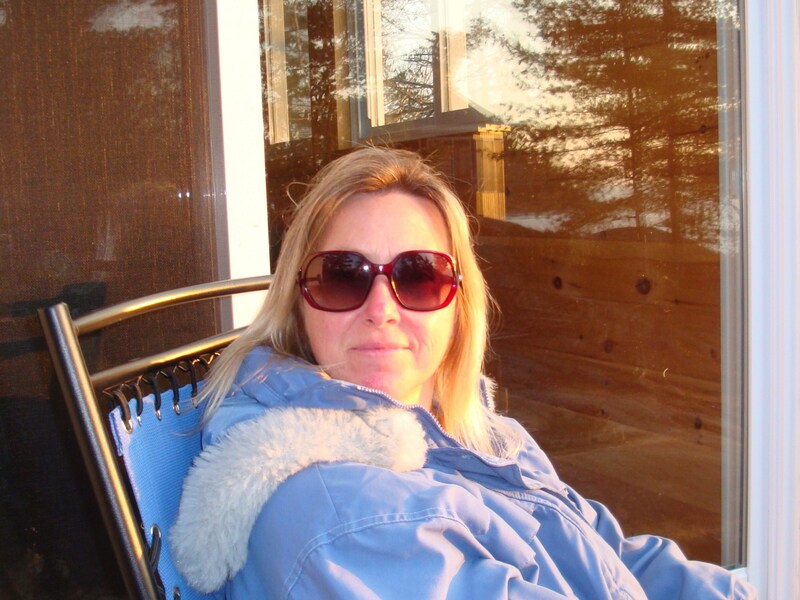 I have been snipping away daily at them for salads and sammies….and then I went to the cottage for 5 days. I just got back in today and wow….there is no way I can eat this amount of lettuce without the help of a herd of rabbits, 5 goats, 4 sheep and maybe a pig or two. They are literally over a foot high and just as wide and the row is over 4 feet long. I may need to get the weed whacker out. I feel a great urge to go and be real neighbourly with my neighbours….and show them how much I appreciate them living next to me. 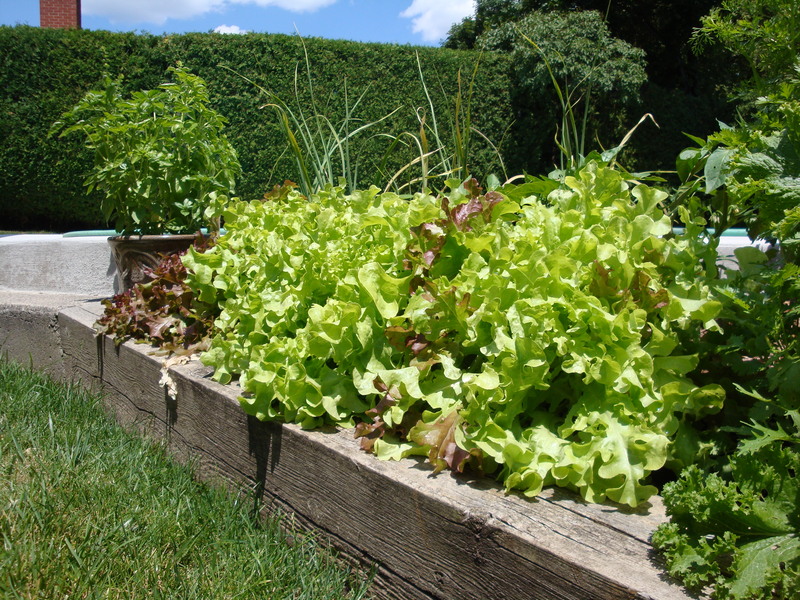 But back to the lettuce….please….please….PLEASE…come and help yourself to some salad. It’s good for you. Maybe even try it with ketchup and pretend it’s a plate of fries from Hutch’s on the Beach.